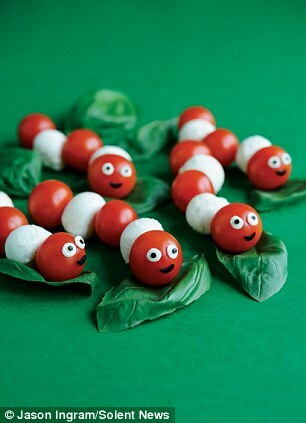 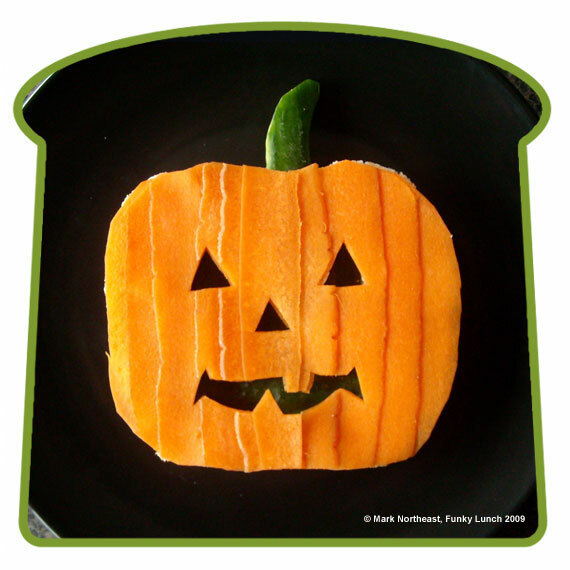 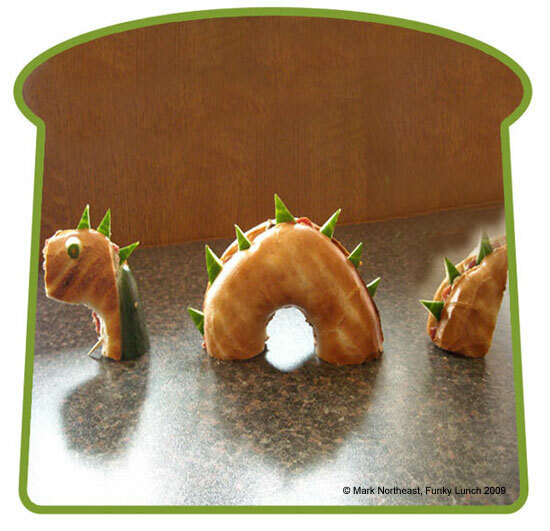 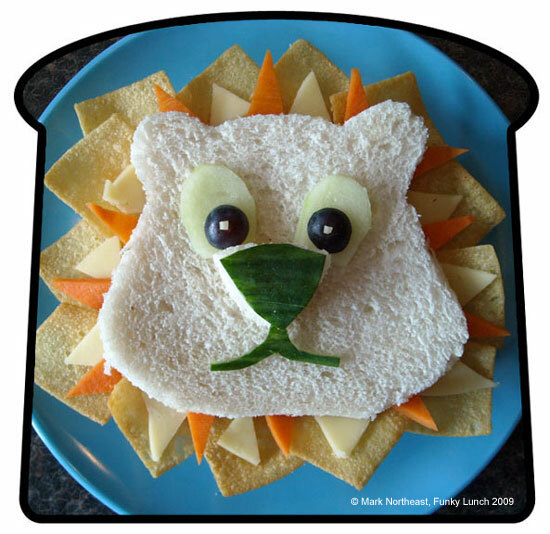 In our previous Edible Art story, we talked about a mother who prepares edible characters for her daughters for lunch at home. 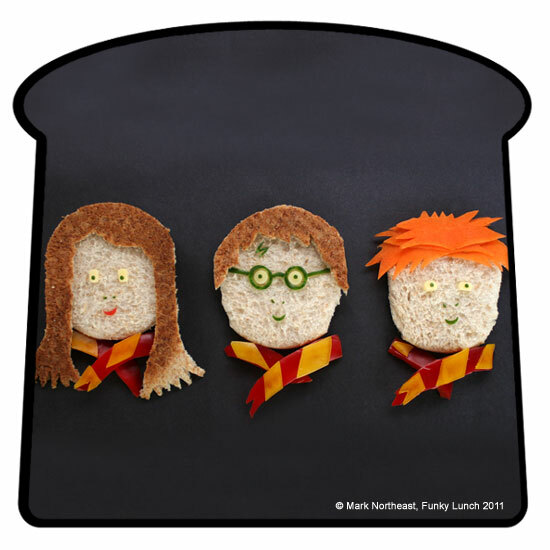 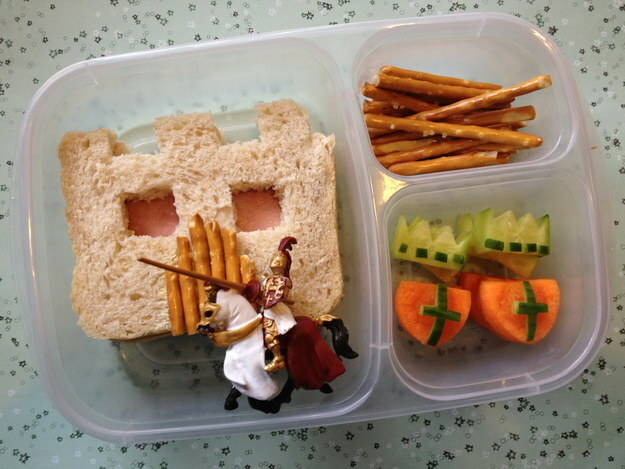 These parents take it to the next level and prepare lunchbox art for their kids to eat at school. 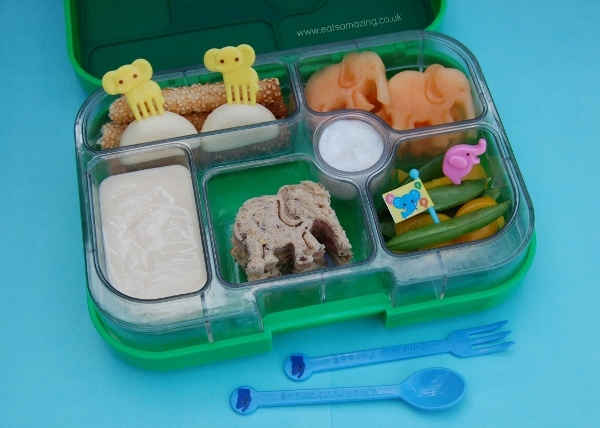 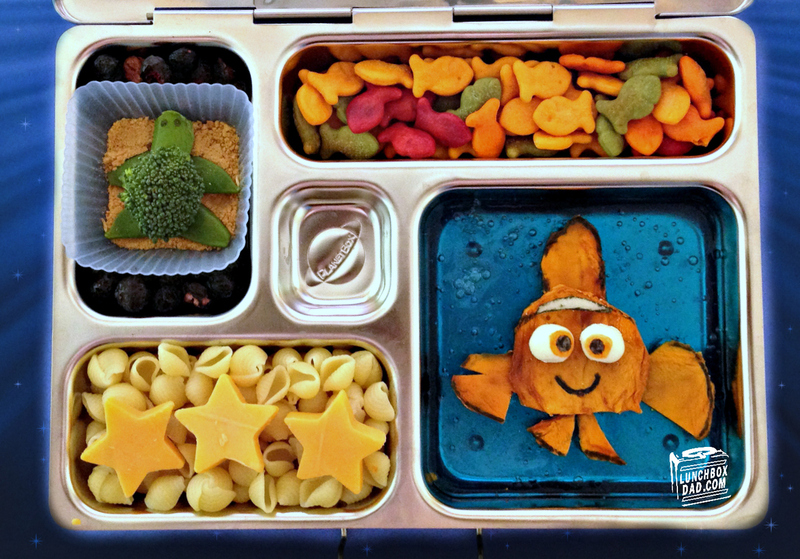 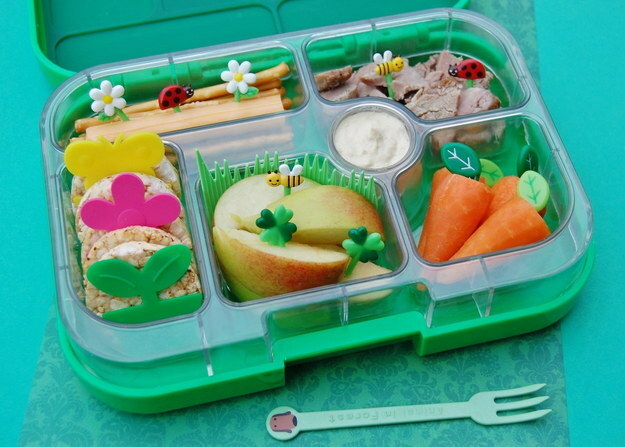 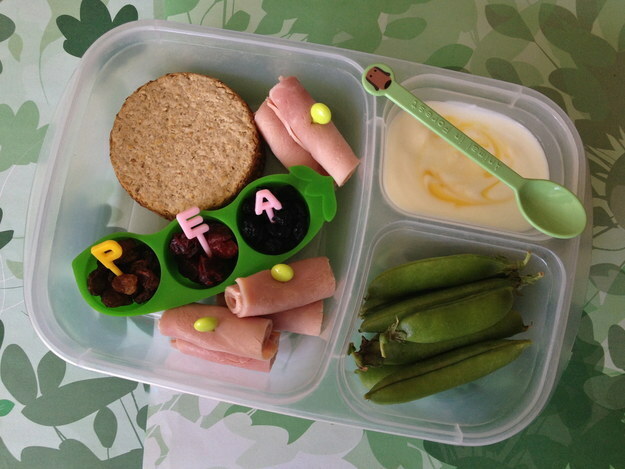 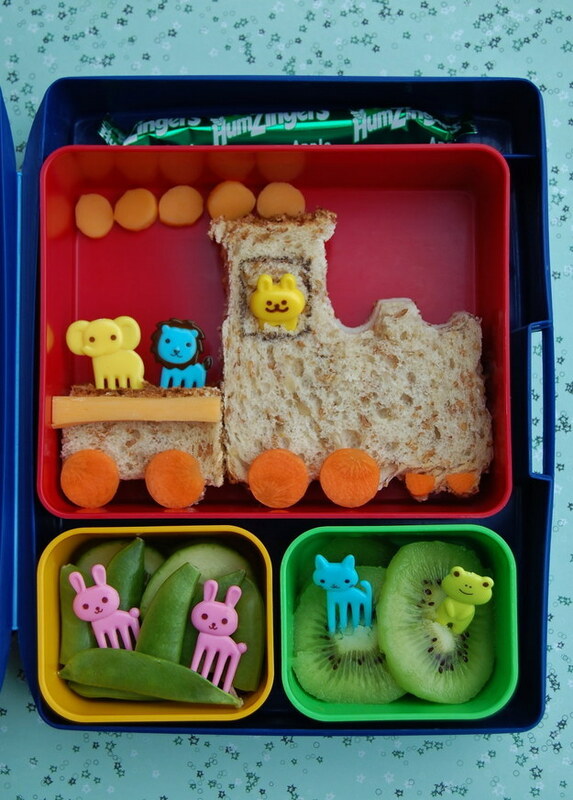 A mother of 2, 6 year old (Small Child) and 1 year old (Small Baby, as she refers to her children on her blog), Grace Hall from Hampshire, UK prepares lunchbox for her elder son everyday. 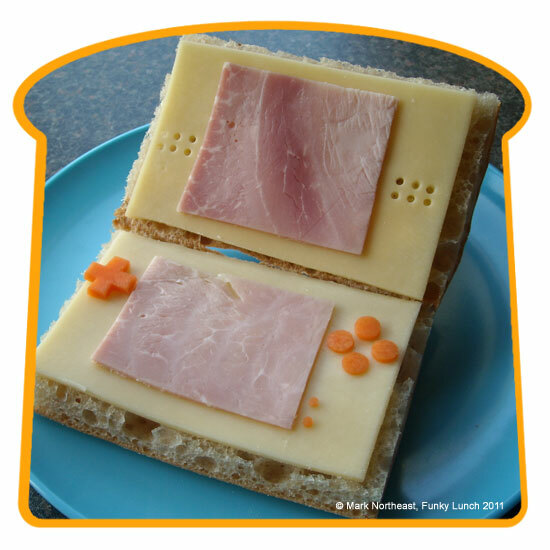 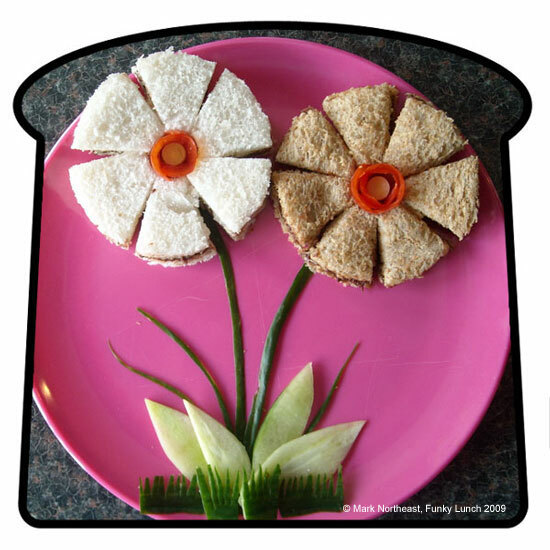 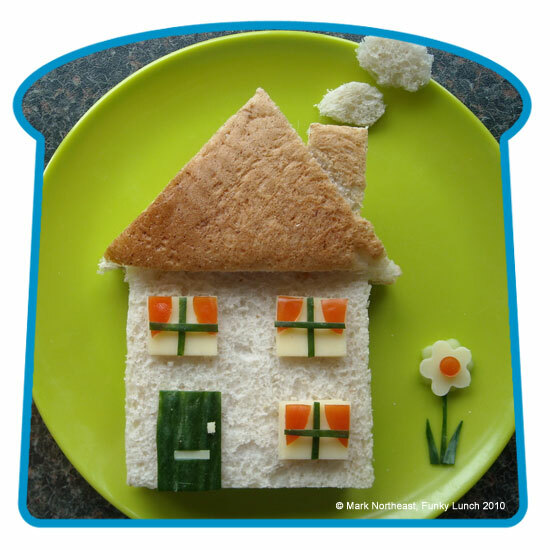 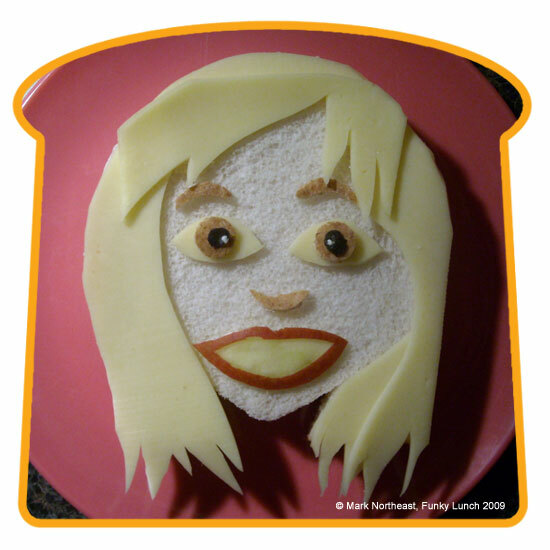 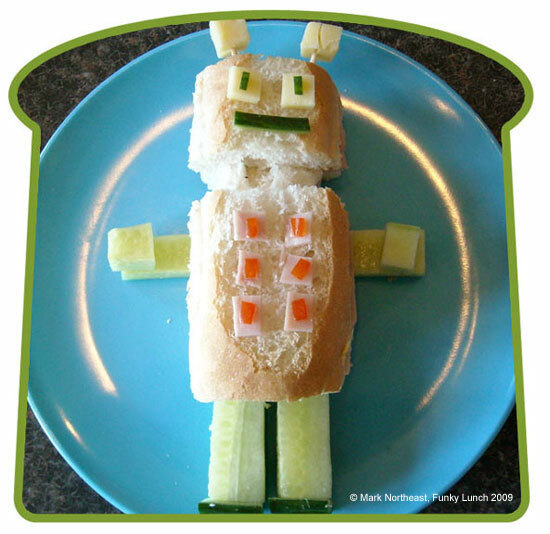 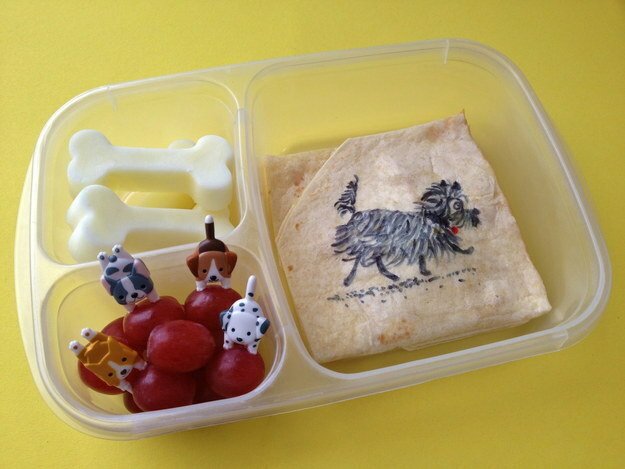 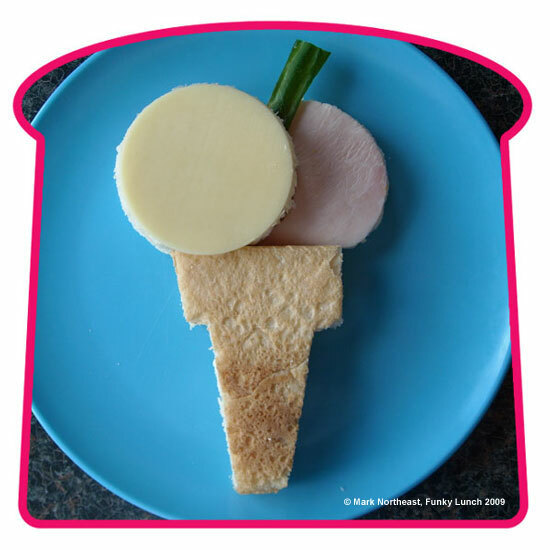 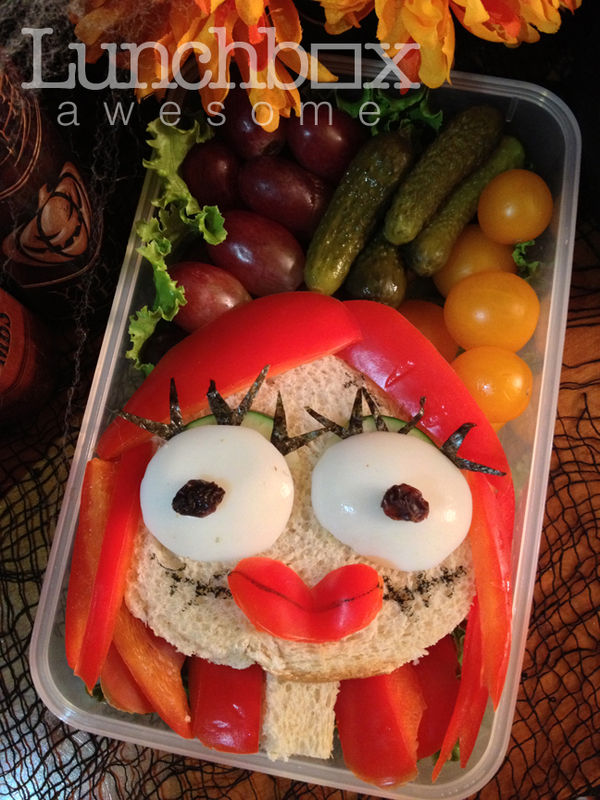 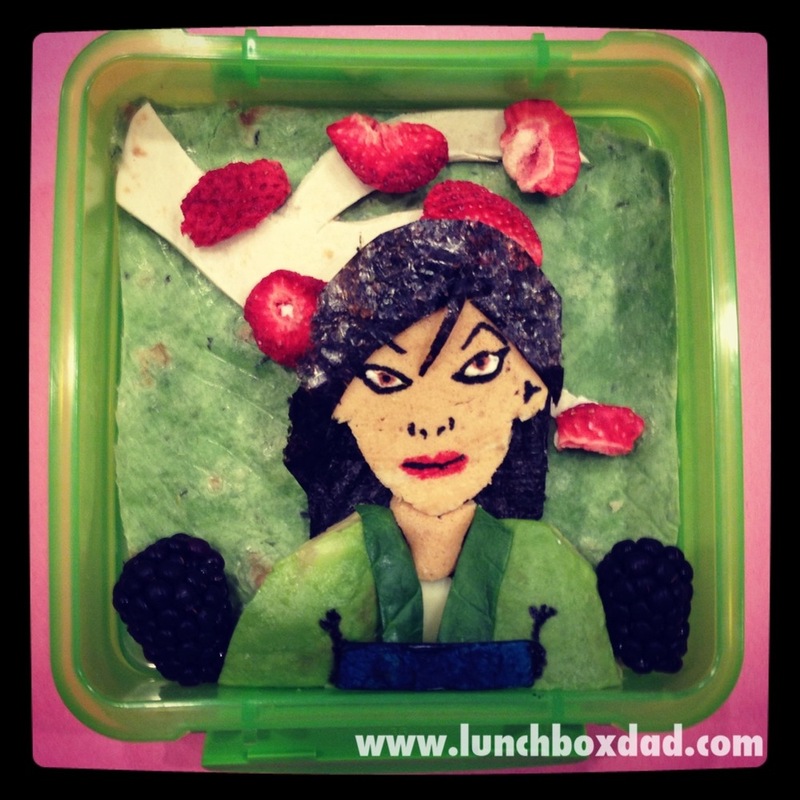 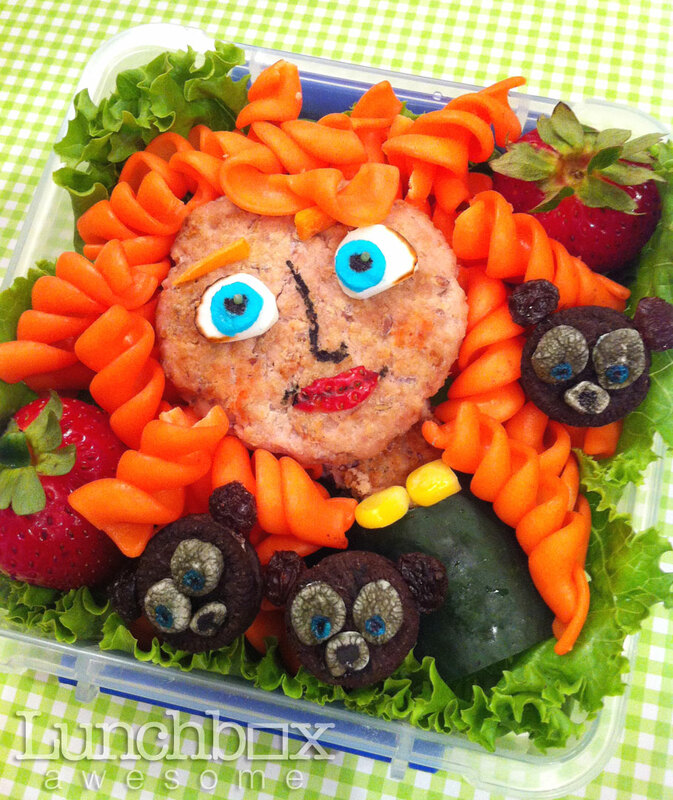 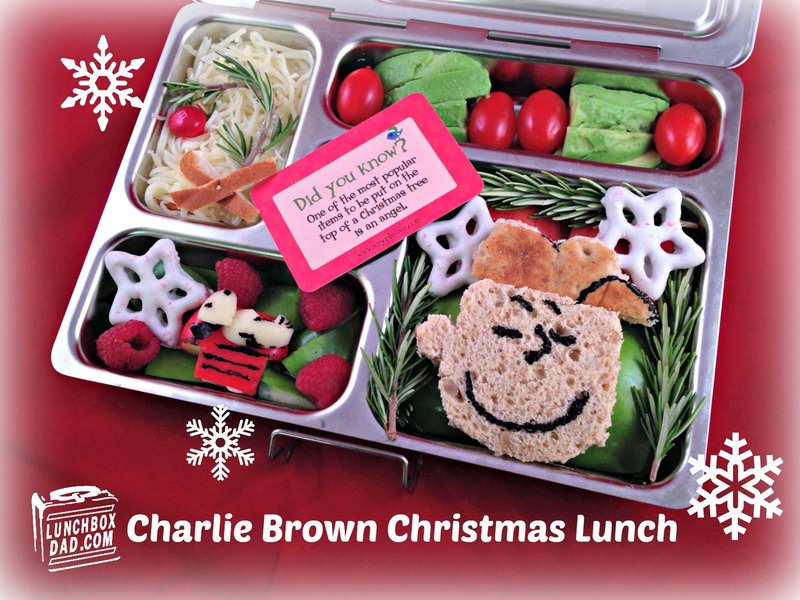 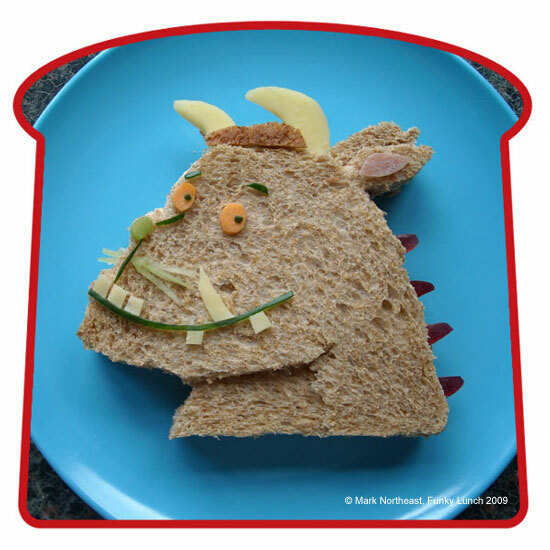 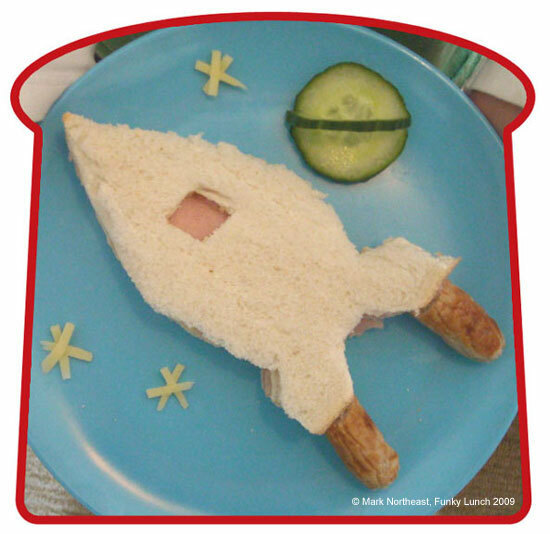 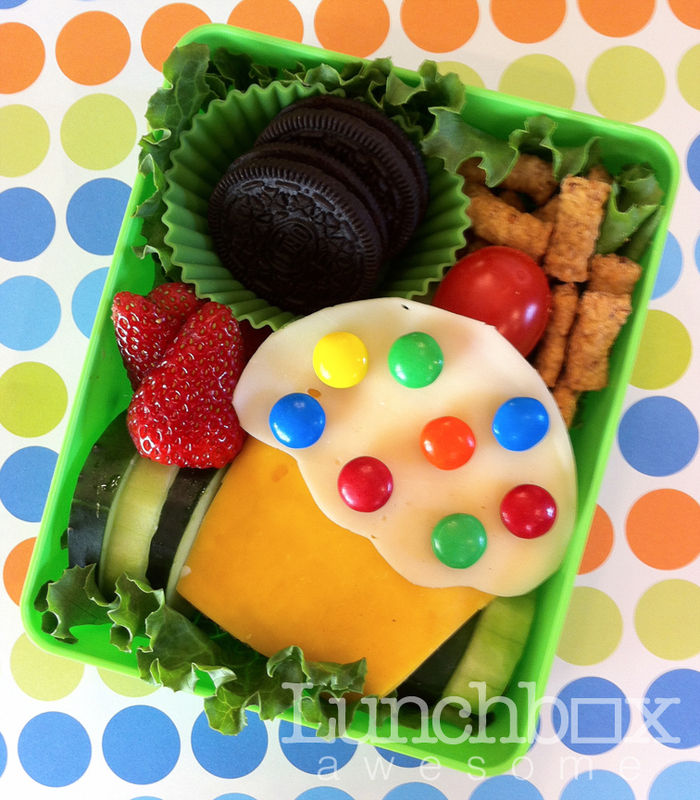 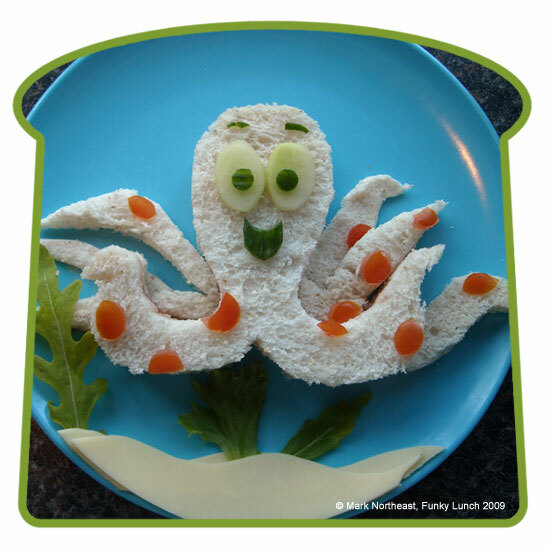 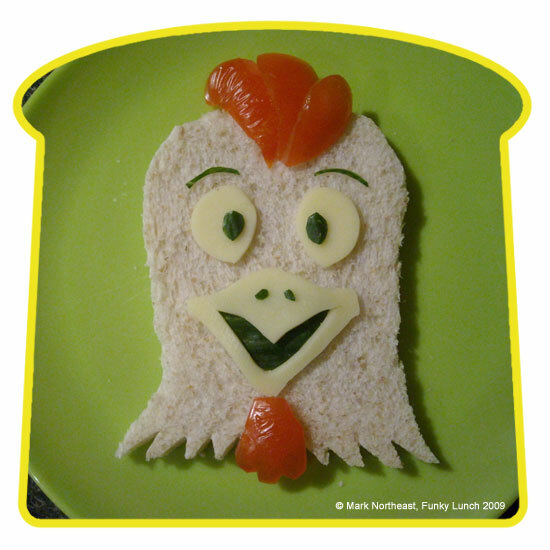 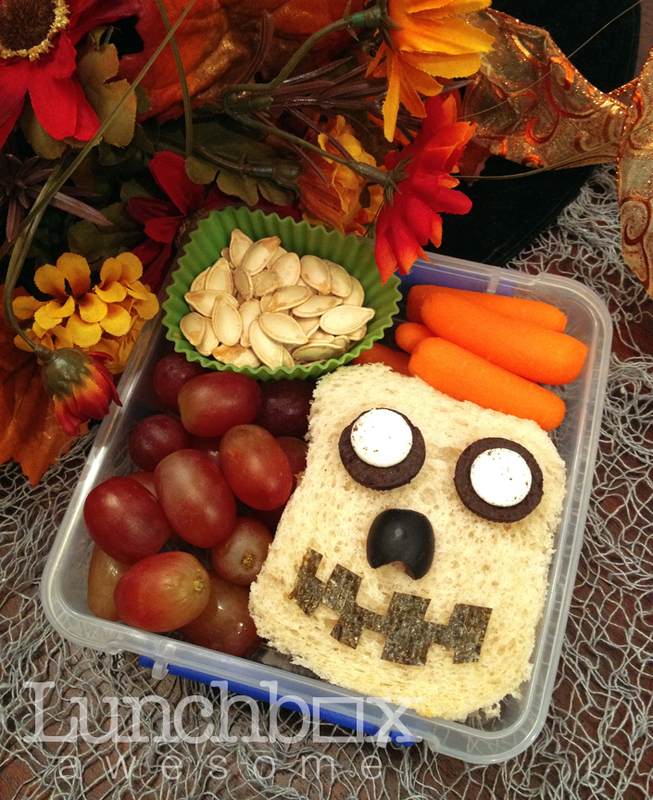 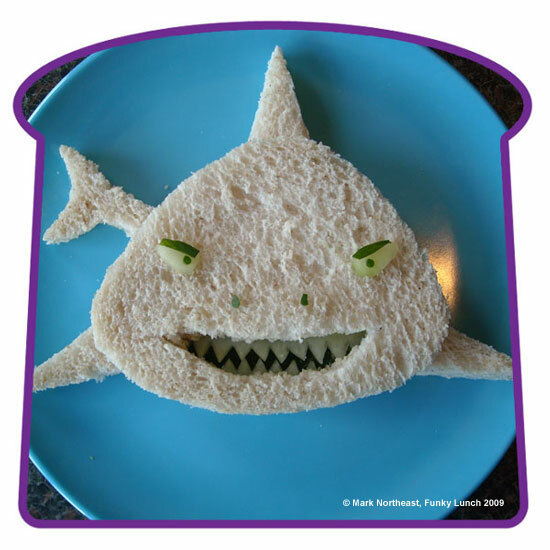 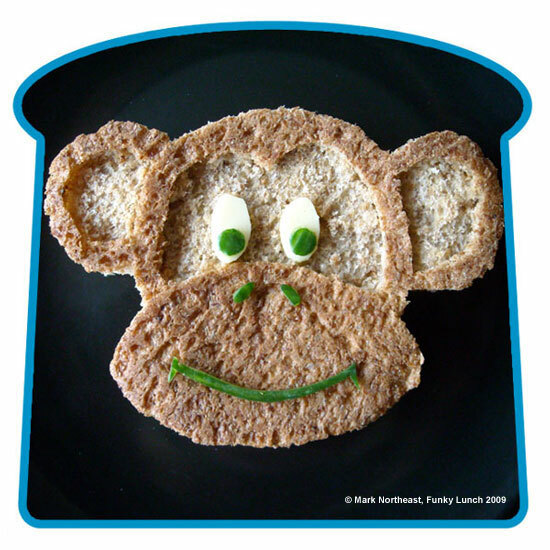 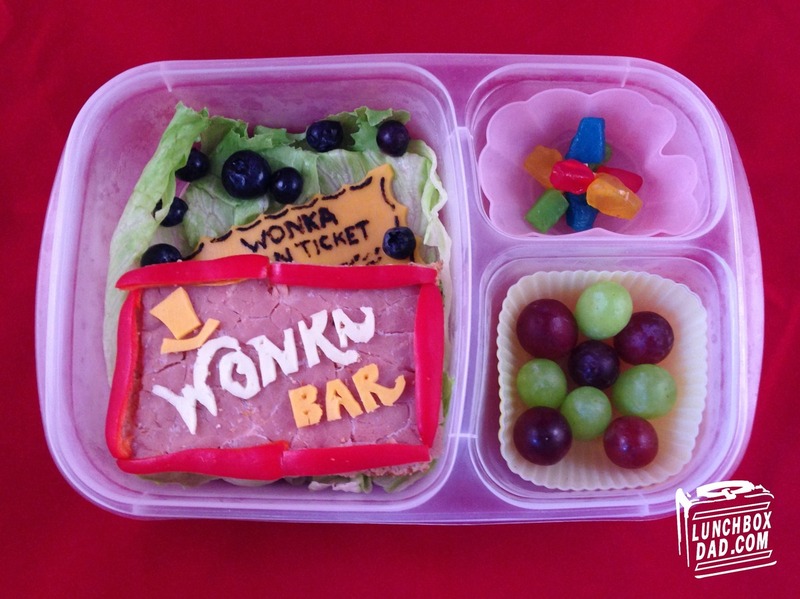 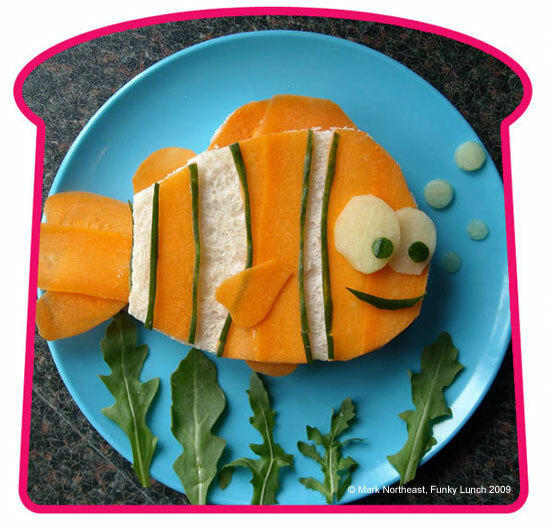 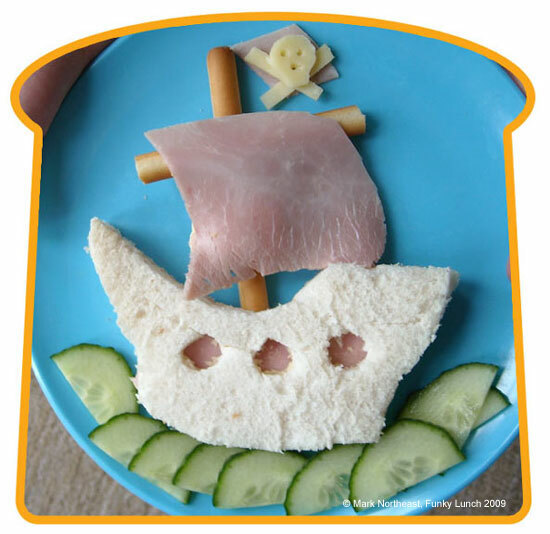 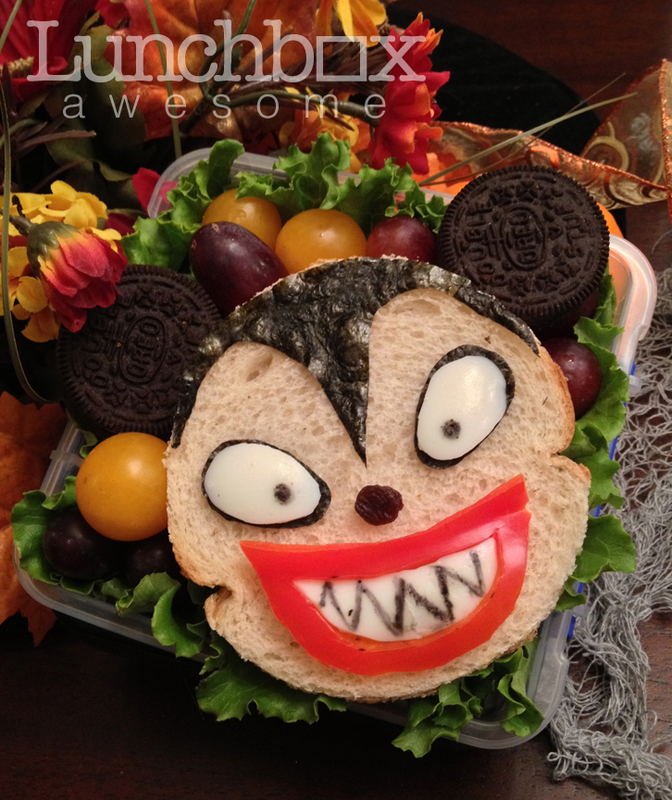 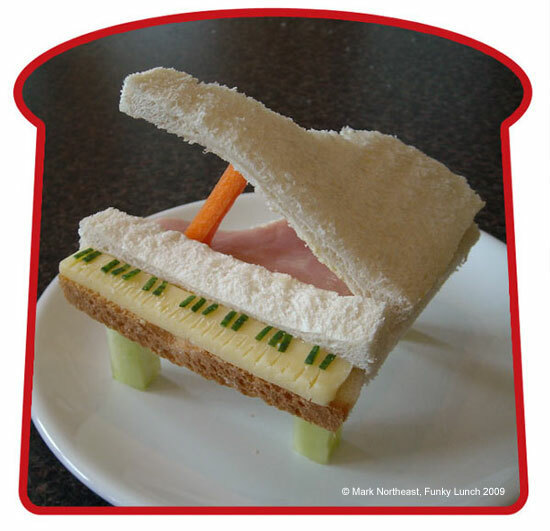 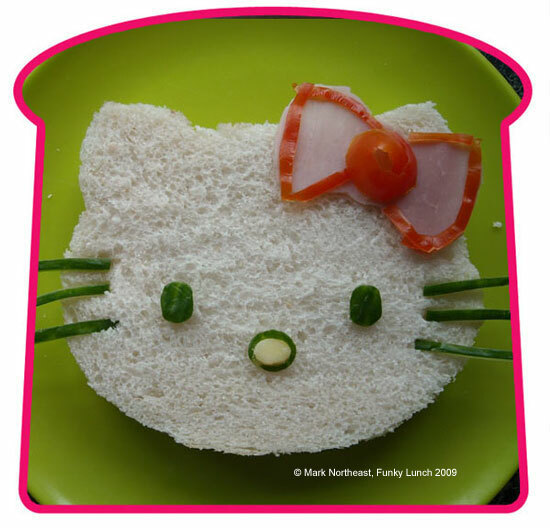 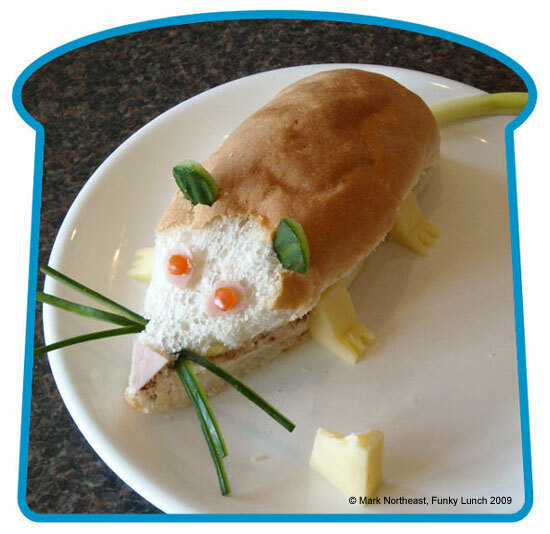 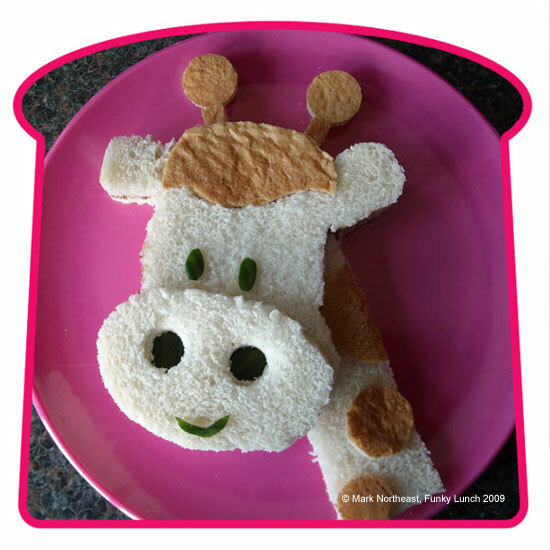 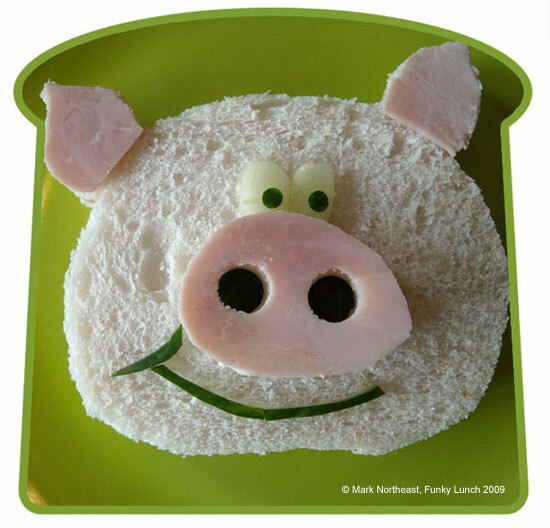 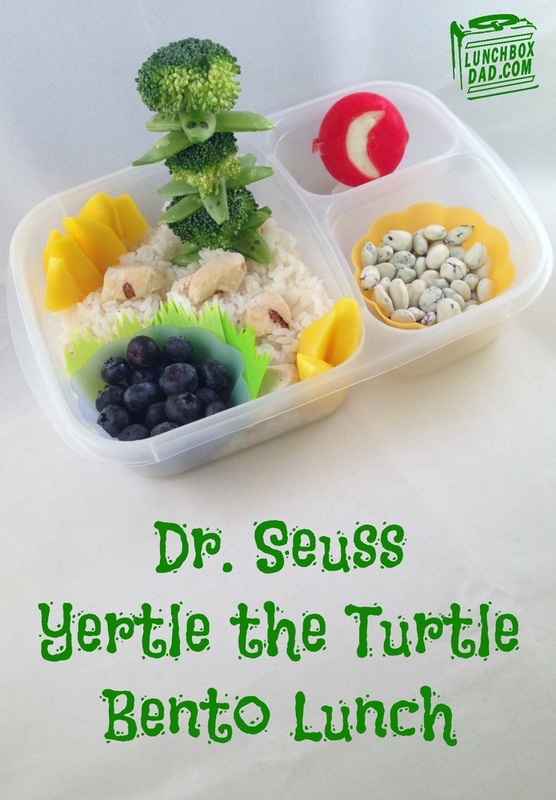 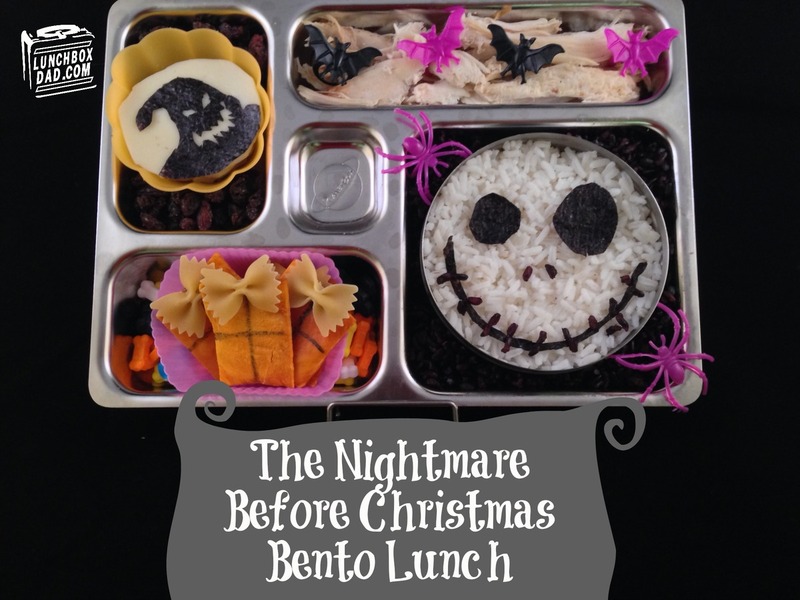 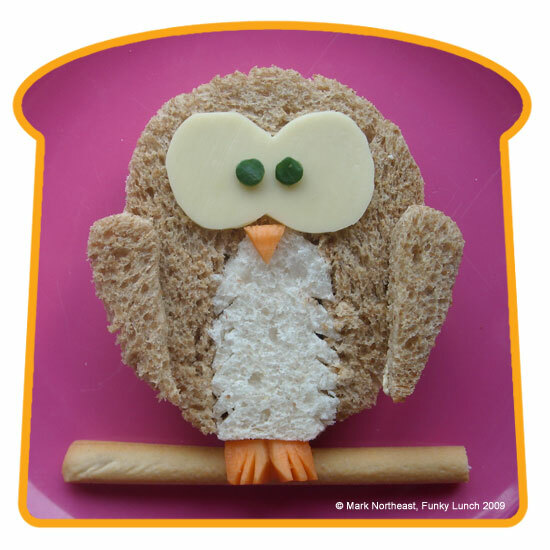 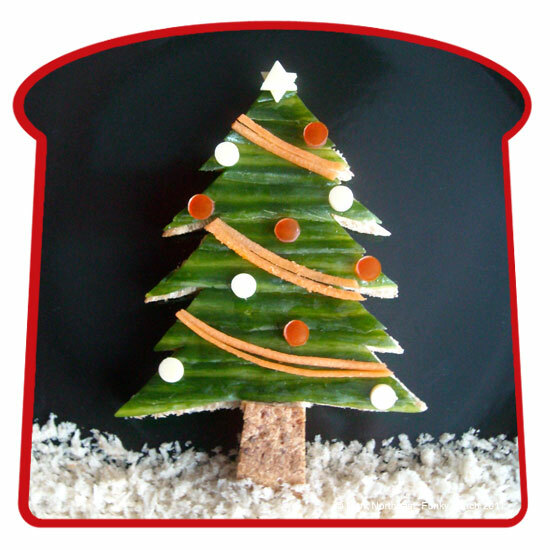 She has a blog – Eats Amazing on which she shares all her lunchbox artistic creations with the tools and the method to prepare the lunch box. 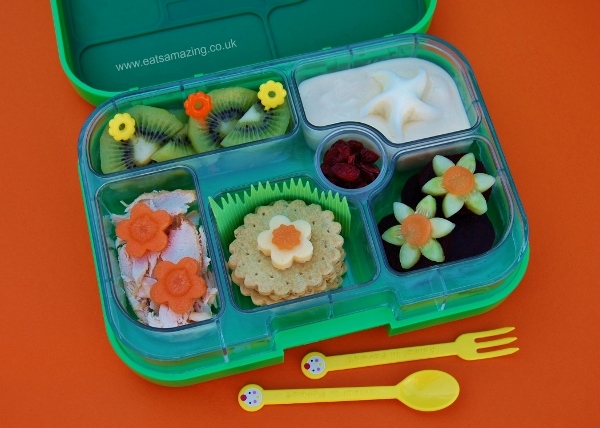 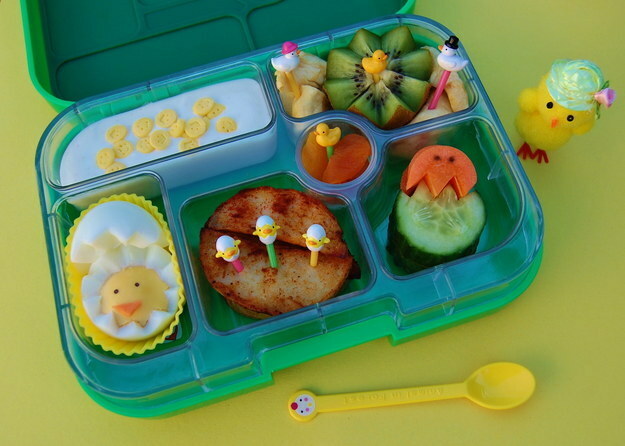 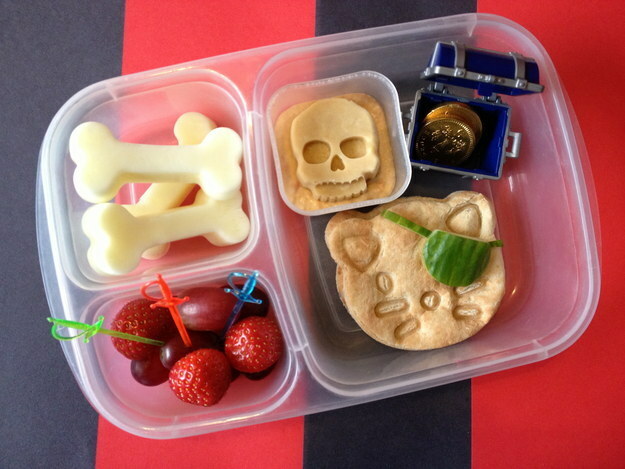 She also has an online shop on her blog where she displays various tools such as animal picks, bento boxes, bento cutters and cute sauce and food containers for sale across UK. 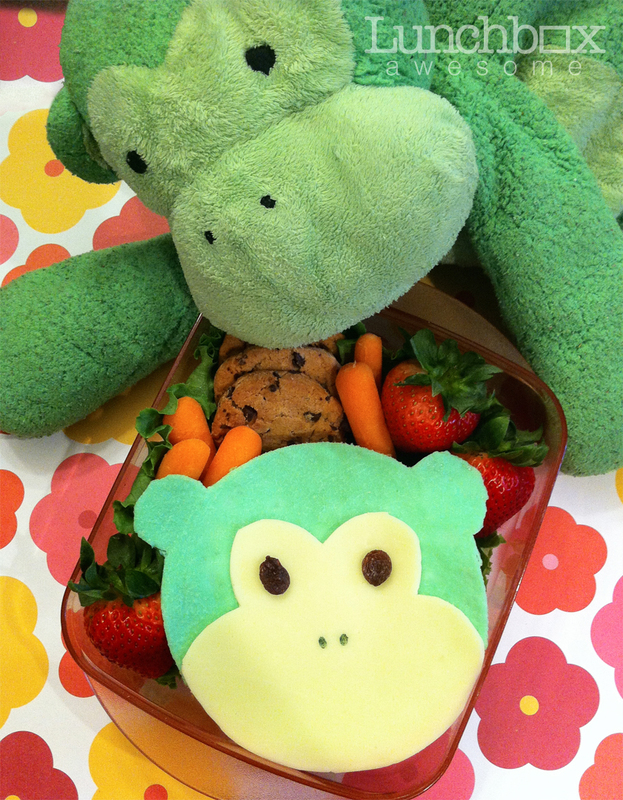 Wish, she had an international store. 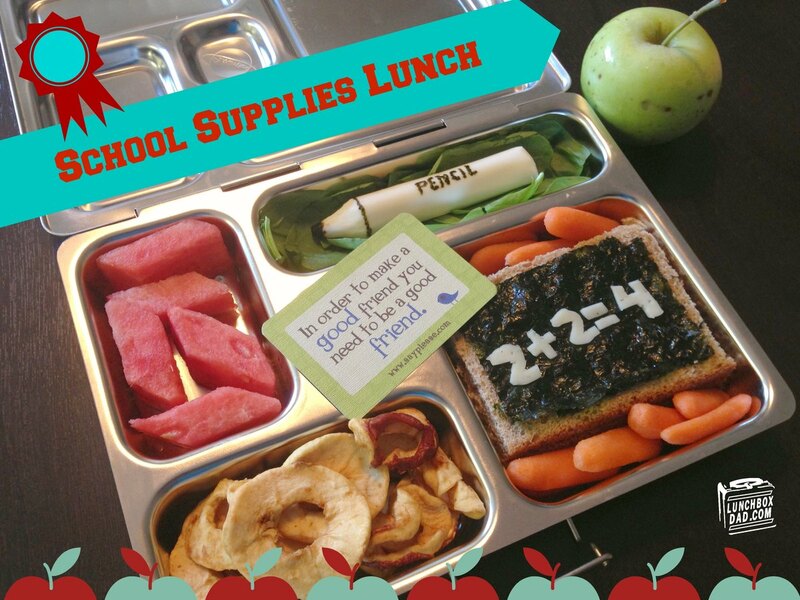 I would love to buy these tools and get to work. 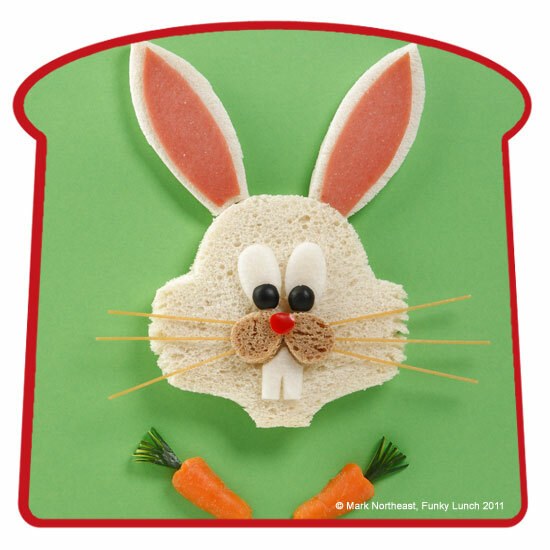 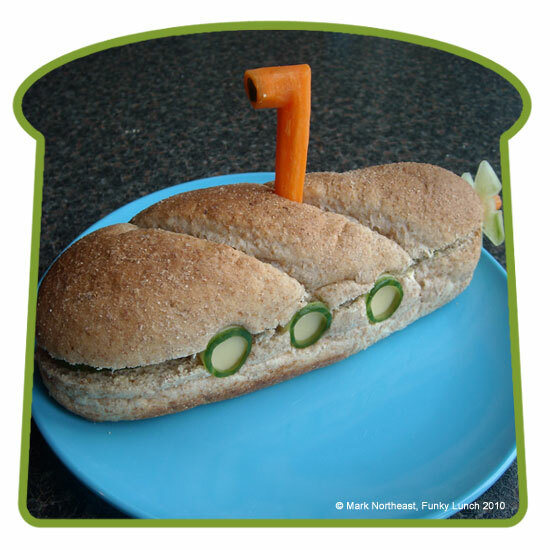 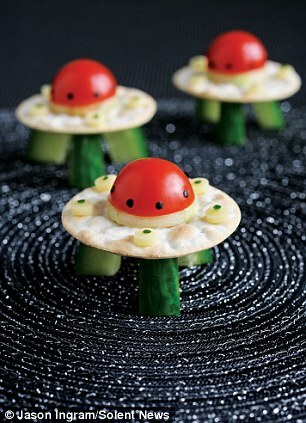 Another father of two from the UK, Mark Northeast creates flying saucers, crocodiles, flowers, piano, animals, cartoon characters like Spongebob Squarepants (which inspired his son Oscar to start eating Tomatoes) and many other designs with food for his children. 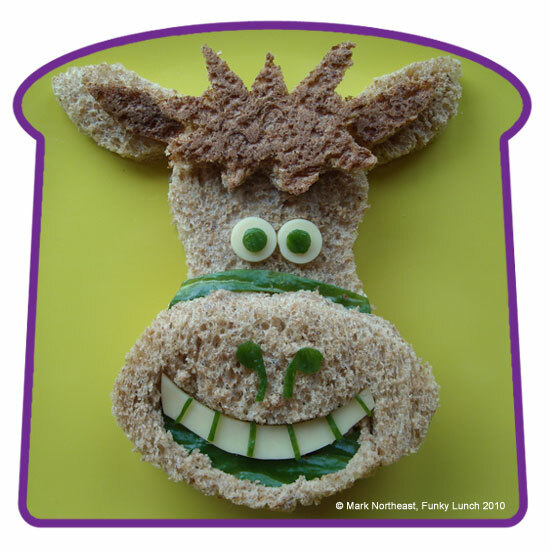 He offers party catering services through his Funky Lunch company and conducts creative food workshops in schools. 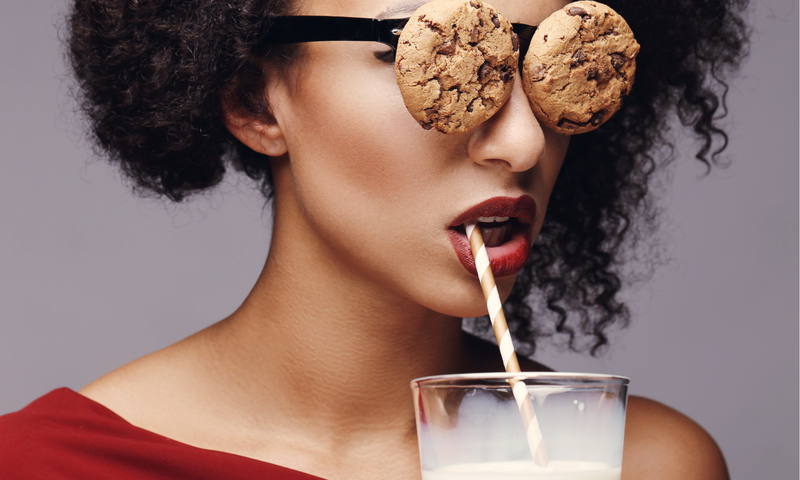 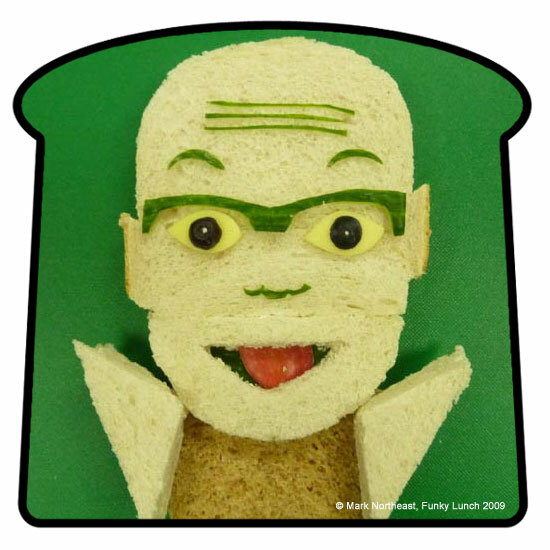 His books, Funky Lunch and Funky Party explain his way of creating artistic food. 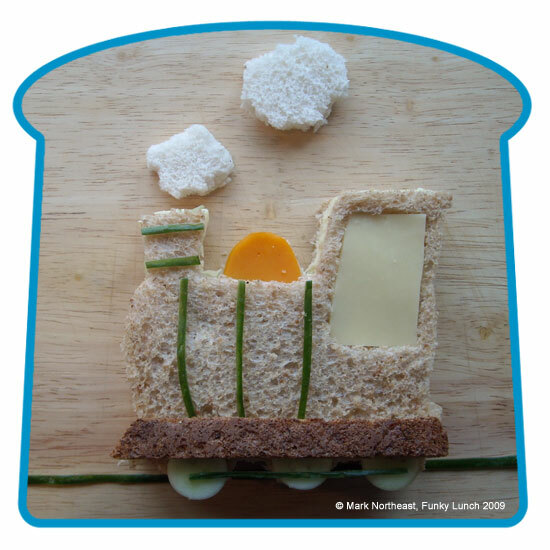 Find out more about him and his work on his website. 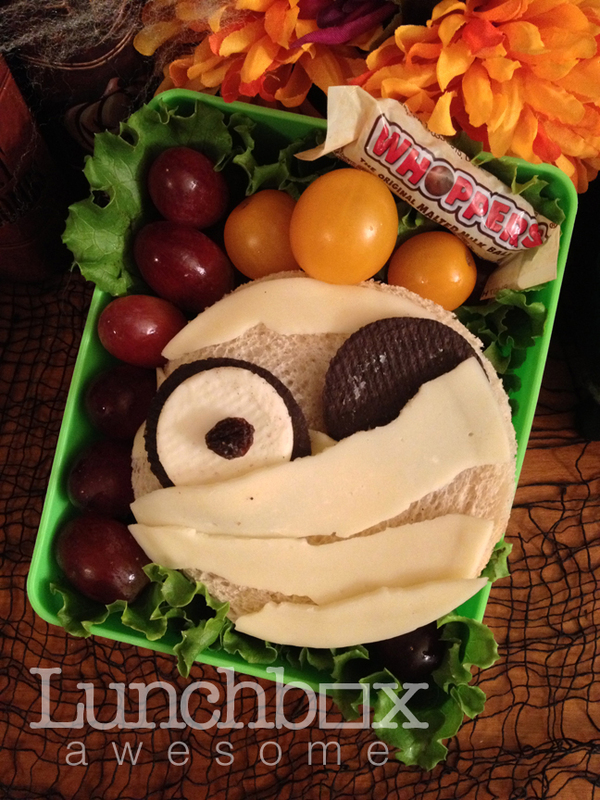 Beau Coffron, the Lunchbox Dad is a father of three kids from San Francisco Bay Area. 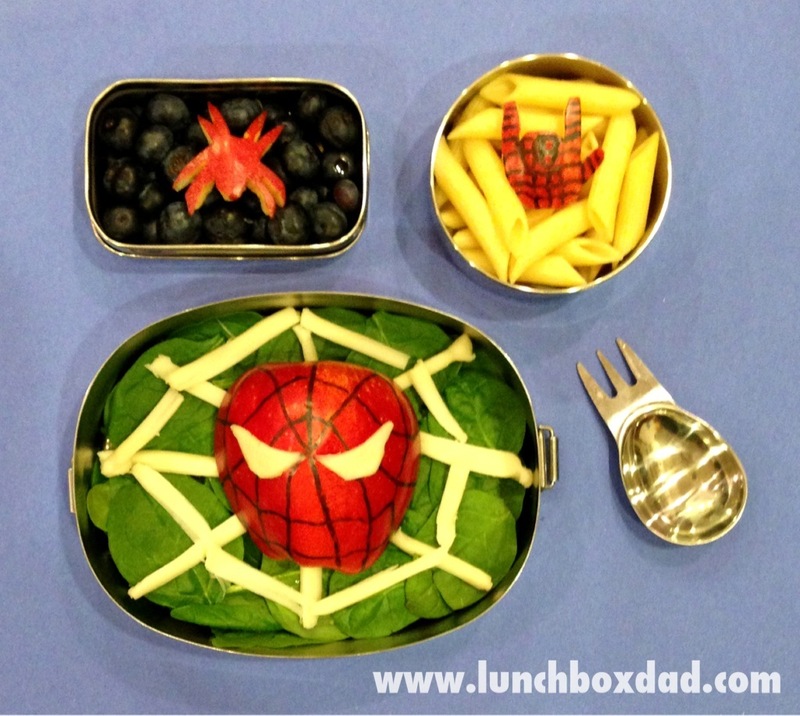 His edible art has been featured in as The Huffington Post, ABCNews.com, Yahoo.com, PEOPLE.com, and has been conferred with Reader’s Choice Top Food Blogger by Babble.com. 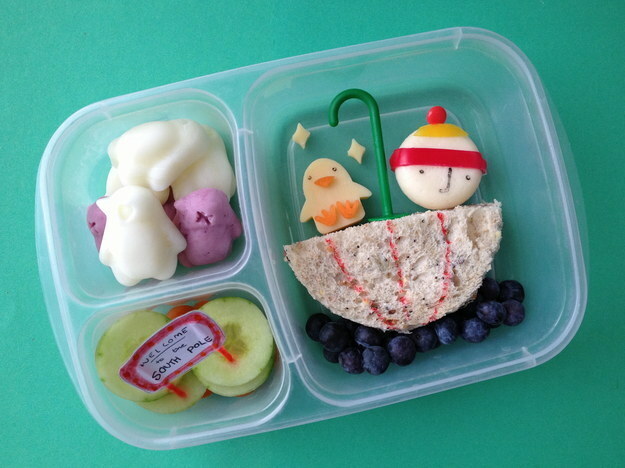 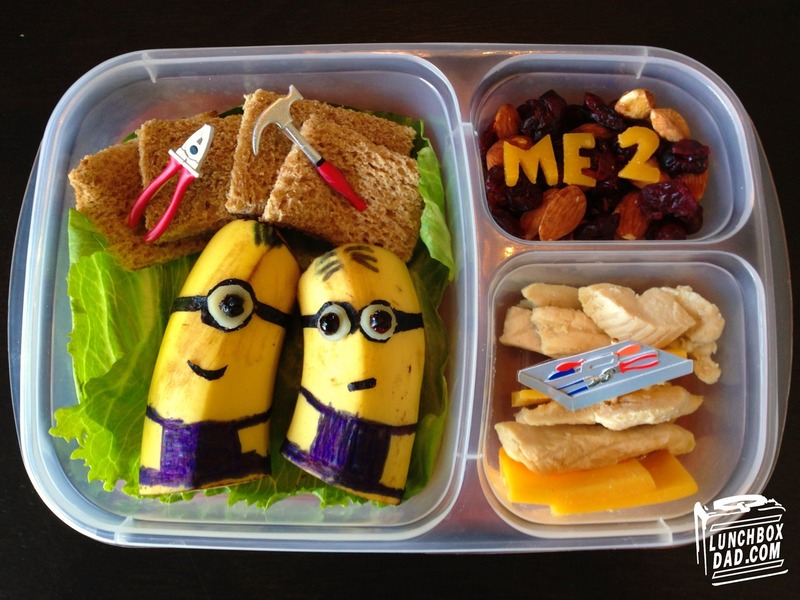 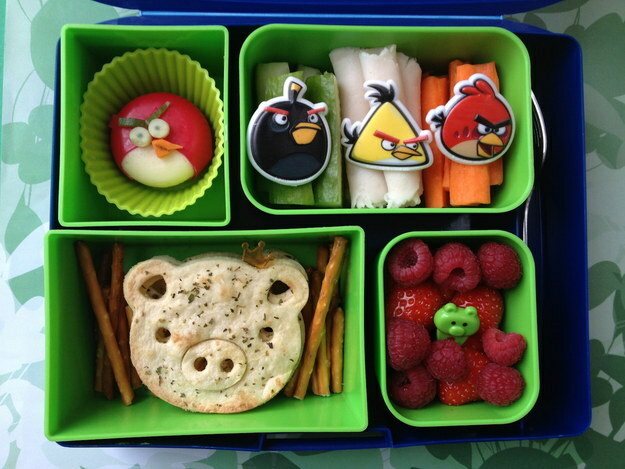 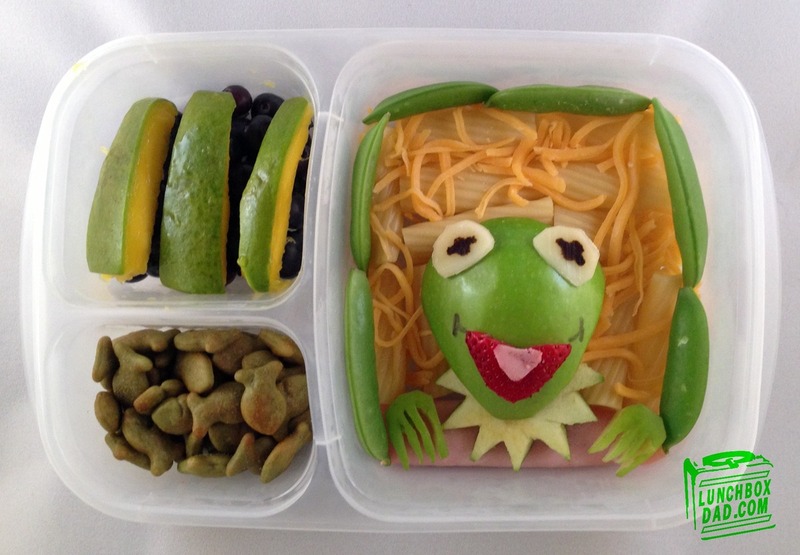 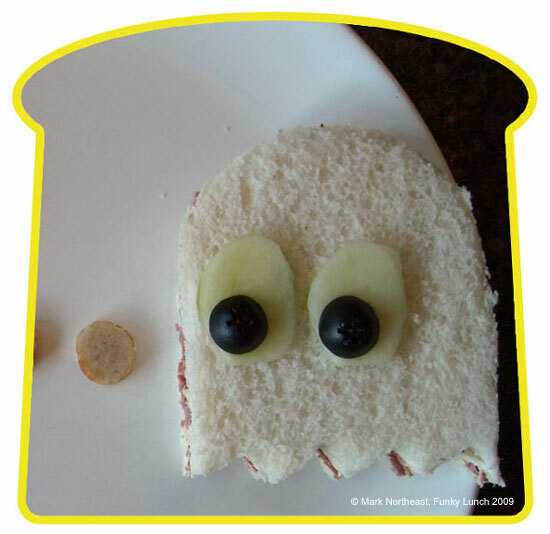 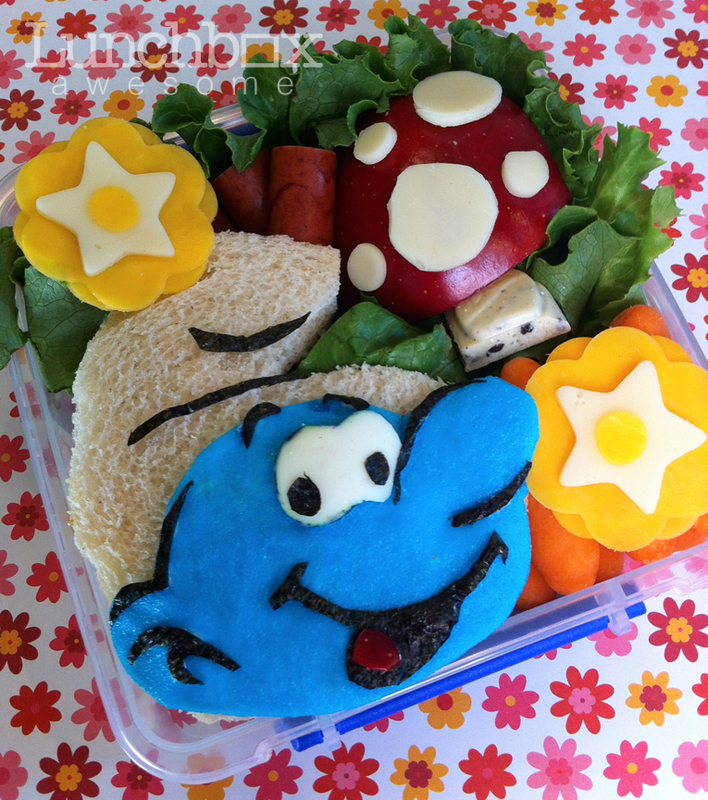 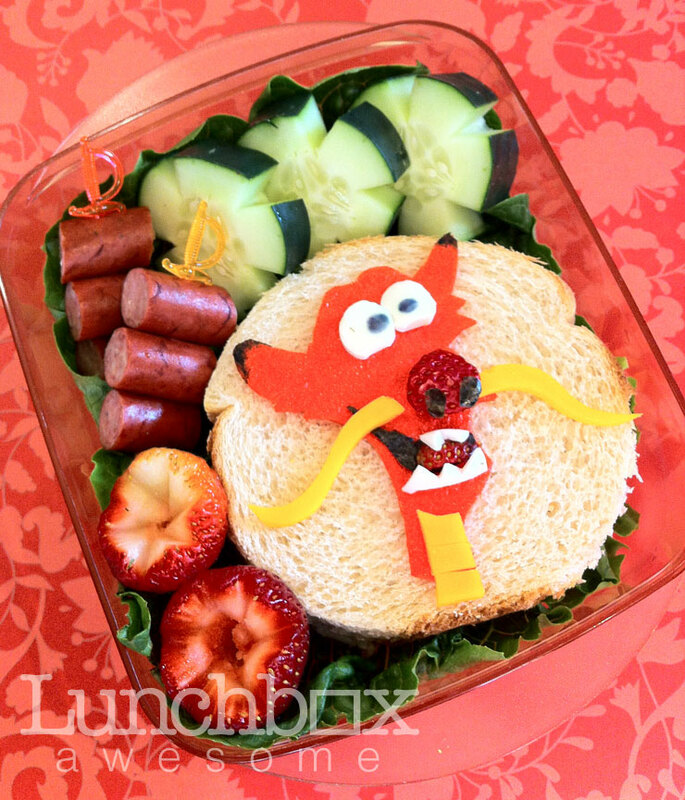 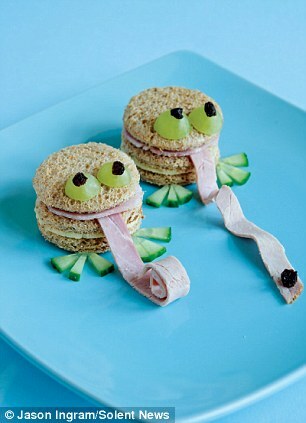 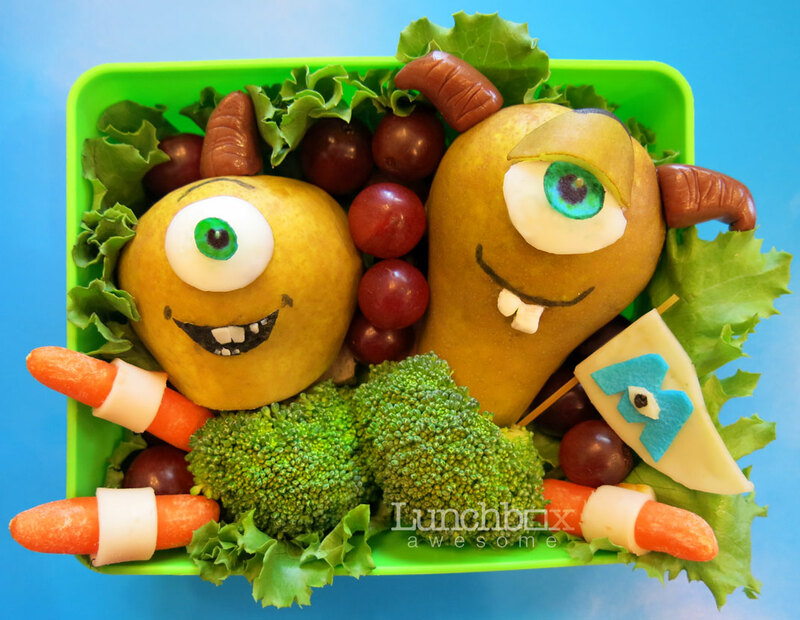 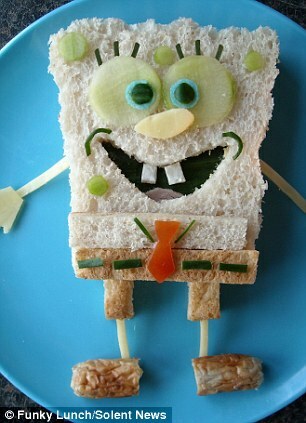 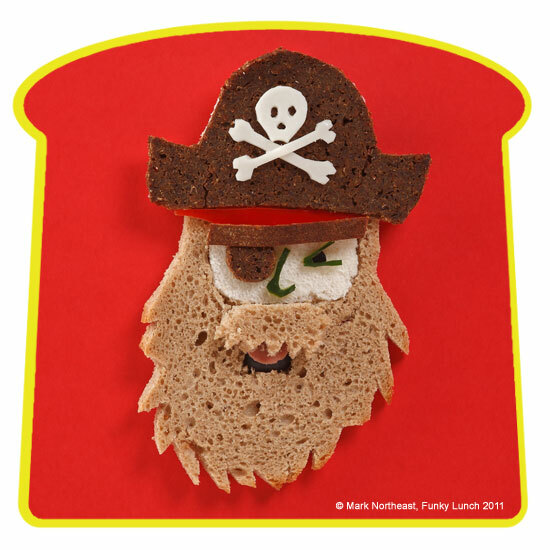 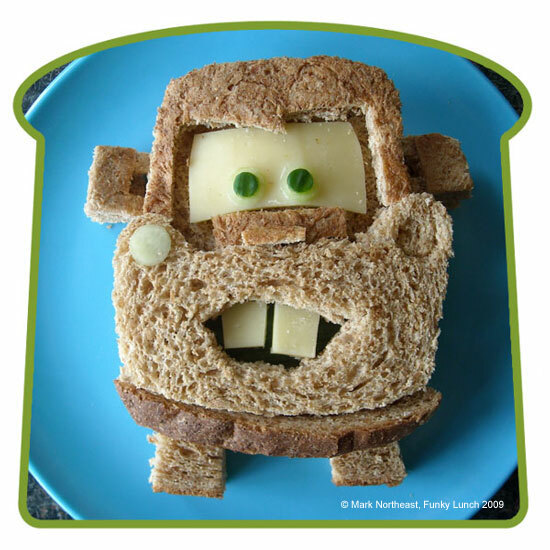 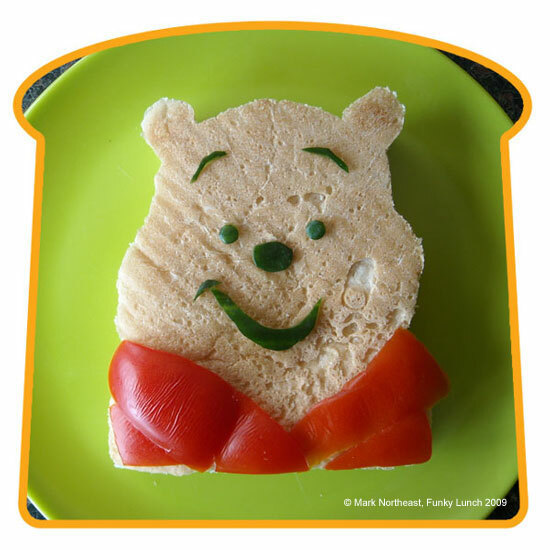 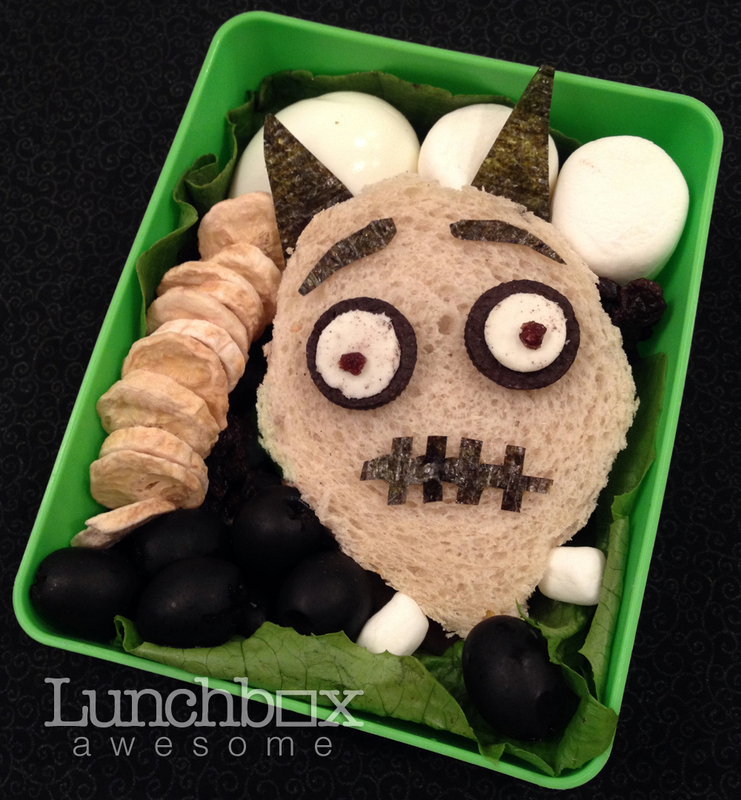 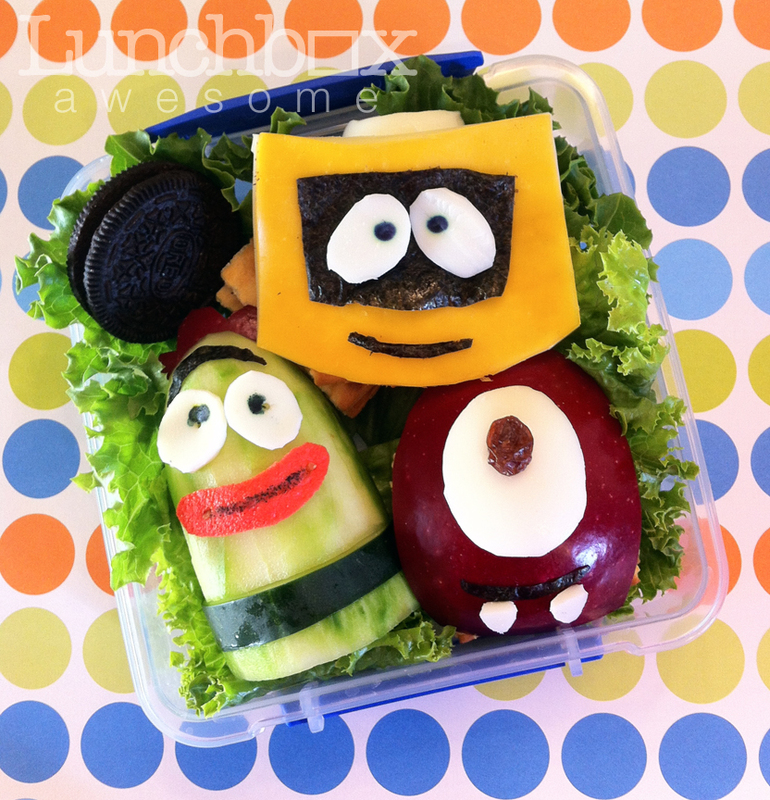 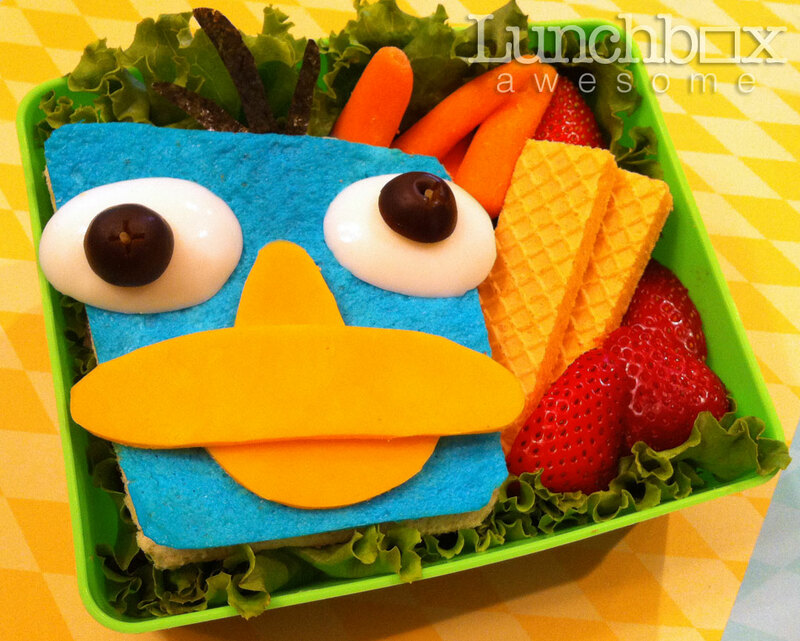 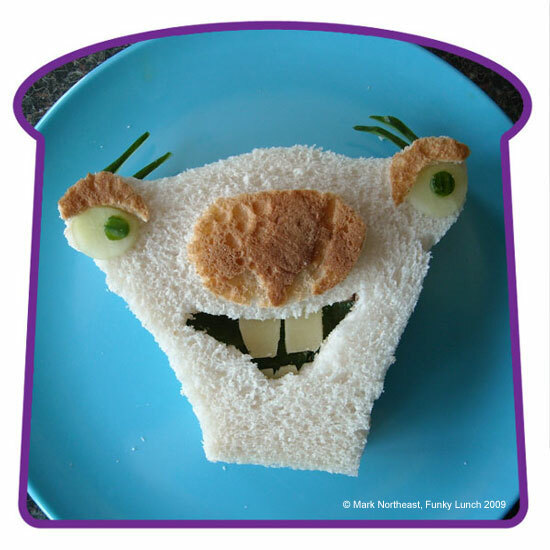 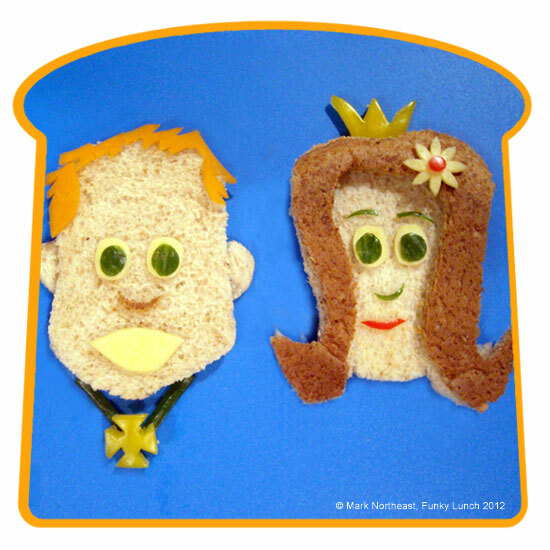 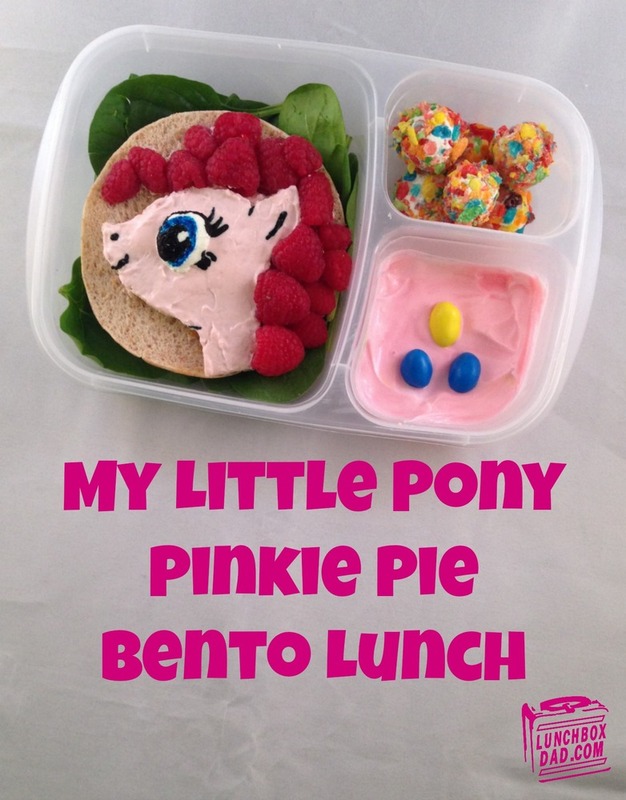 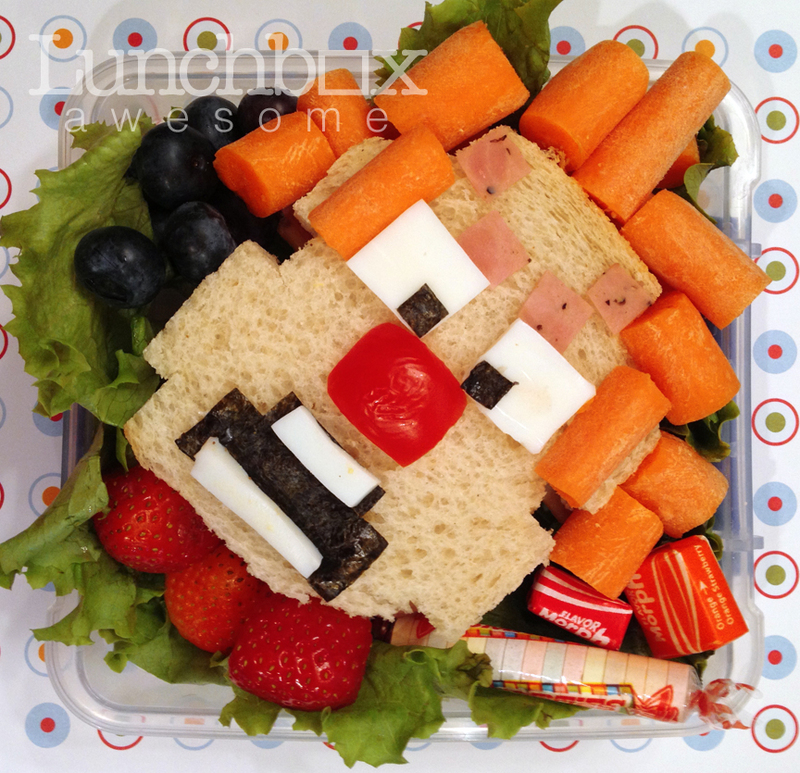 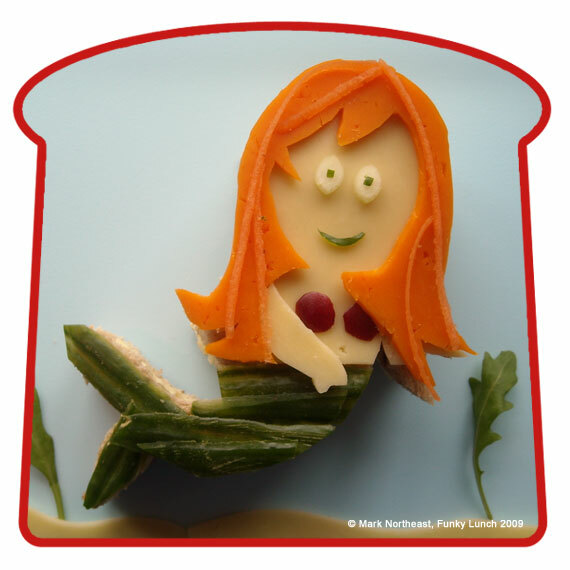 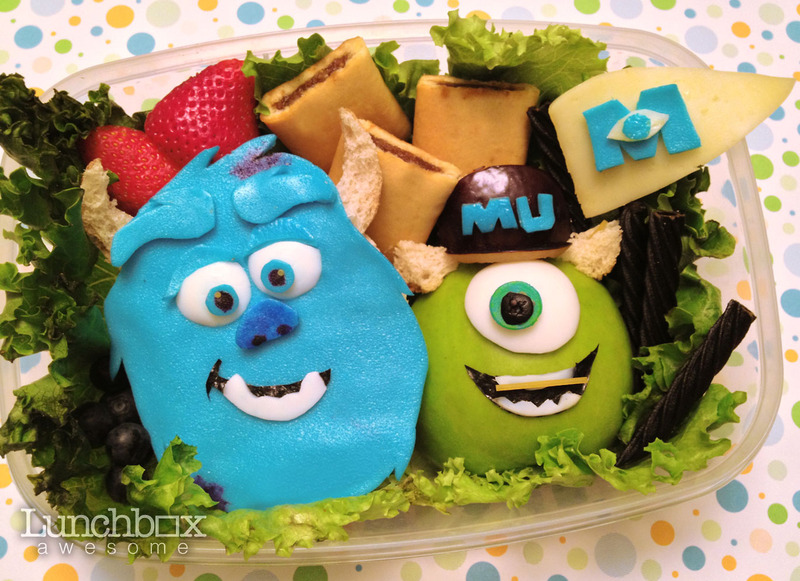 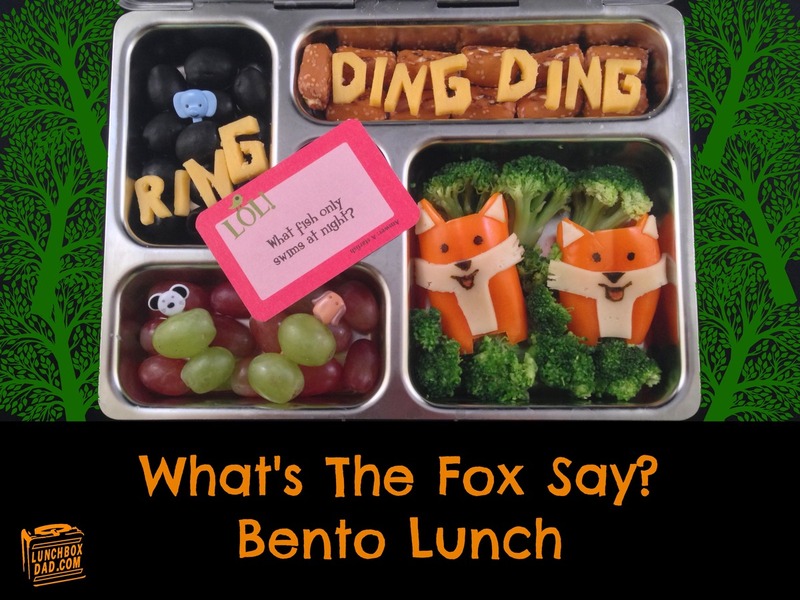 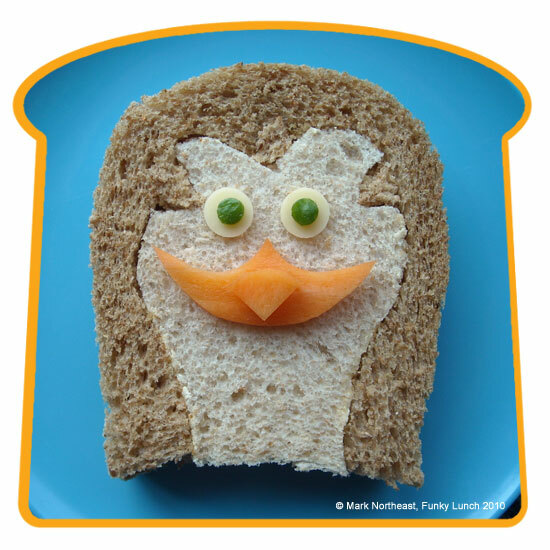 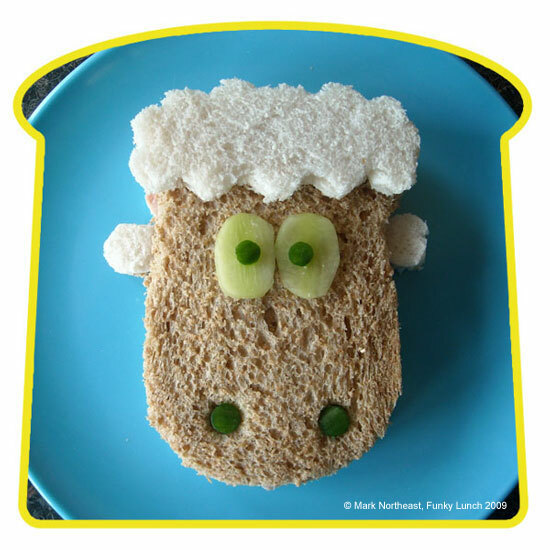 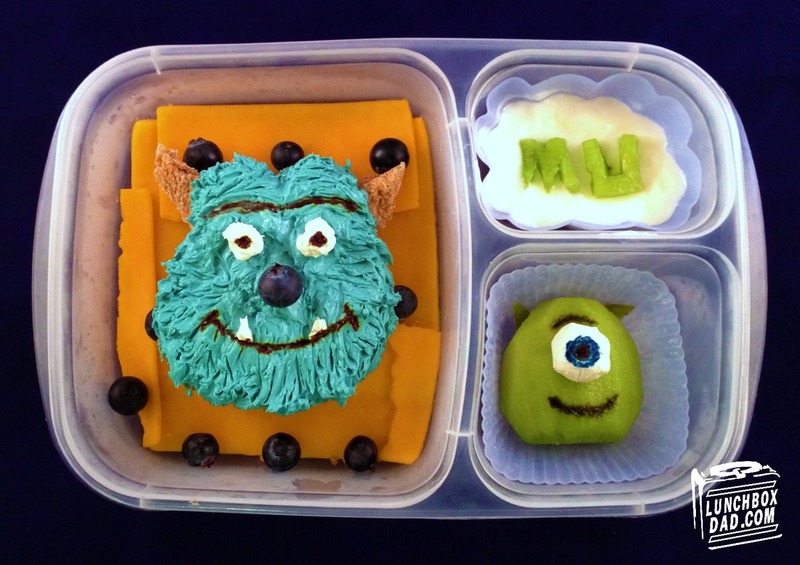 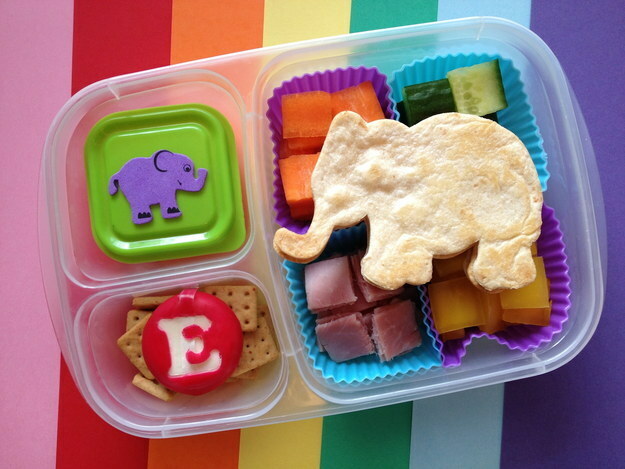 Heather Sitarzewski prepares these amazing cartoon characters for lunch for her son and posts them on her Tumblr Lunchbox Awesome. 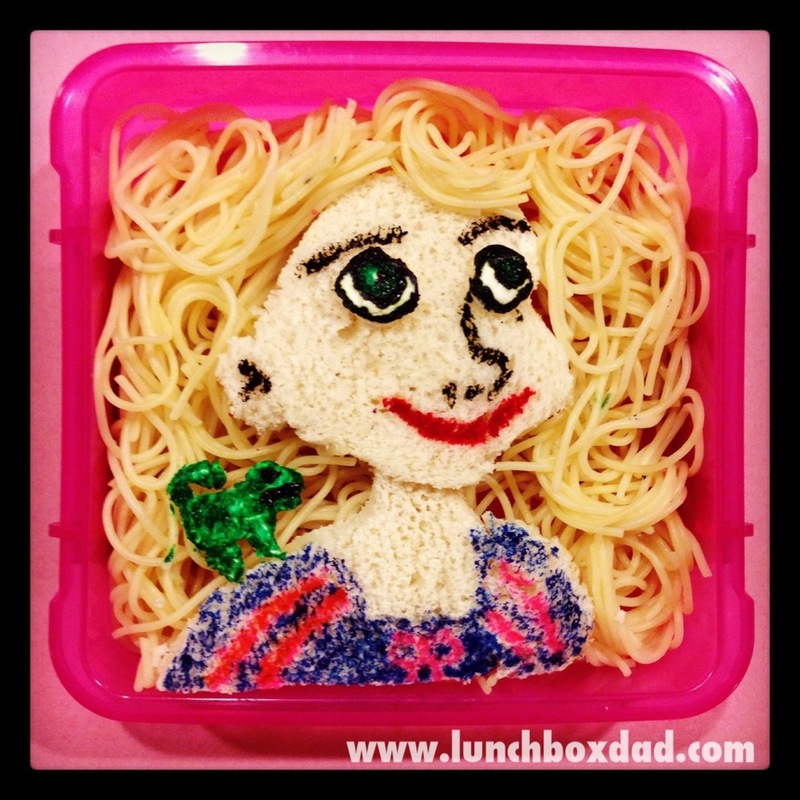 From Smurfs to Goofy to Donald Duck to Olaf, she has it all.